Say what you want about Cruise's Scientology or outright weirdness...dude makes a great movie, and this one is no exception. It's currently resting at 8.6 on IMDB, which is still perhaps a tad too high, though. We really enjoyed the film, and it's remarkable in so many ways (the stunt work, as promised, is spectacular), but if one were to nit, he might say the film is too much of a good thing? 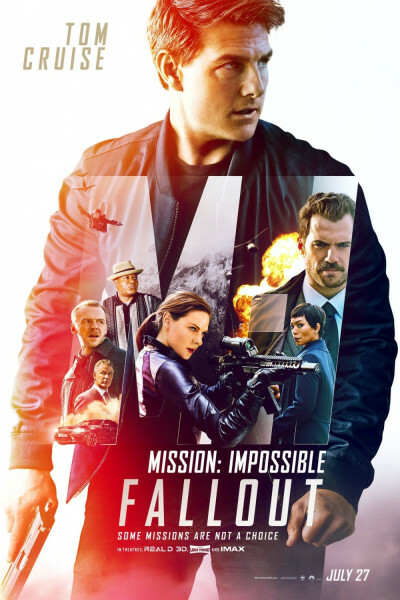 Unlike, say, recent Bond films (during which one gets a few quiet scenes to collect himself and his thoughts), Mission: Impossible—FALLOUT ceaselessly hurries, bounces, and jostles its jockey and spectators. As a result, I find it somewhat difficult to fully savor and enjoy what happens from scene to scene. Like an otherwise hasty wine, chocolate, or cheese tasting, a lemon sorbet in between servings proves divine, if only to cleanse the palate before swinging to whatever's next. It's one heckuva good movie, though, the franchise feeling as fresh today as when it debuted in 1966. Save the [knock on wood] loss of our star due to injury or death, I see no reason why the mission won't remain possible for several more years to come. Heck, I can even envision a neat transitory installment in which Cruise hands his baton to a succeeding upstart and adopts the role of mentor. Meantime, here's to another three or four episodes in the canon featuring Ethan Hunt's current crew. I love the chemistry between Pegg, Rhames, and Ferguson, and look forward to seeing them combust on screen a few more precious times. They really are becoming my new A-Team.